What do you use...Liz Smith? 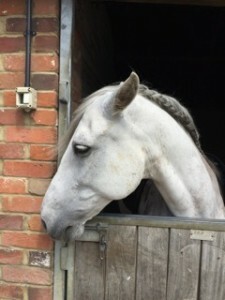 Liz emailed us about her lovely horse Matrix, what he eats and why he’s definitely an Equimins fan! Meet Matrix, he’s a Pure Bred Spanish (PRE) Gelding who came over to the UK as a 5 year old and who I’ve owned for the last 8 years. He’s truly my horse of a lifetime; very hot, very handsome and very brave. He can turn his hoof to most things and has taught me a huge amount. He loves attention and more so when people come armed with a camera! He’s been a model for a professional artist and paintings of him now grace homes in the UK, Dubai and the USA. I also commissioned a bronze of him by the very talented equine sculptor, Sarah Coward, who has done Miner’s Frolic and Chilli Morning. As I work long hours with my job, we have recently been restricting ourselves to schooling and hacking. 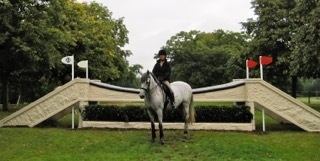 But Matrix does love a good outing and has done a couple of sponsored rides – including the fabulous one at Burghley. He loves a posh arena and doesn’t seem to be phased by banners and loudspeakers. He’s also shown he’s a dab hand at jumping. 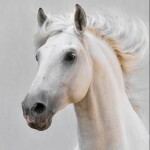 As Matrix is never lacking energy, and since sugar is an enemy of most Spanish horses, he pretty much lives on fresh air and I’m lucky that he has always been in good health. By chance I read about Fenugreek and as Matrix produces his best work in the school when he is relaxed, I thought I would give it a go. I picked up a pack of Equimins Fenugreek and gave him a bit to try. Well, to say that he took to it straight away is an understatement; I think he would have eaten the whole 1 kilo pack at one sitting if I had let him! It’s as thought I had just offered him a whole bucketful of mints. He’s seen more chilled when being schooled and doesn’t seem as gassy. When we ran out I struggled to get any more Equimins Fenugreek I had to go for another brand, well he turned his nose up at it (even though it was more expensive!). Luckily I managed to get a couple of bags of Equimins and so all is good in Matrix’s world again!